Rozafa castle is a castle near the city of Shkodër, in northwestern Albania. It rises imposingly on a rocky hill, 130 metres above sea level, surrounded by the Buna and Drin rivers. Shkodër is the seat of Shkodër County, and is one of Albania’s oldest and most historic towns, as well as an important cultural and economic centre. Founded by the Illyrians in antiquity and rebuilt much later by the Venetians and then the Turks, the fortress takes its name from a woman who was allegedly walled into the ramparts as an offering to the gods so that the construction would stand. The story goes that Rozafa, the unfortunate woman chosen to be walled up in the castle for good luck, asked that two holes be left in the stonework so that she could continue to breastfeed her baby. There’s a spectacular wall sculpture of her near the entrance to the castle’s museum. 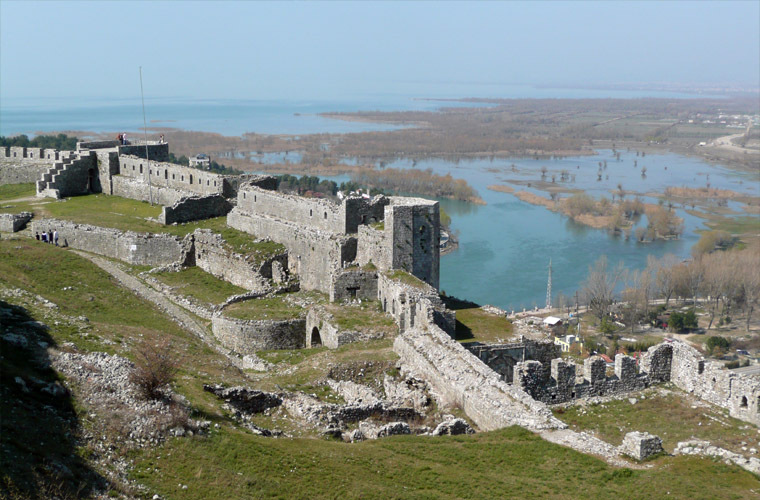 There’s little left to see inside the castle itself, save the ruins of various structures and the impressive walls, from which there are superb views over the city and Lake Shkodra.